It’s been a long winter! 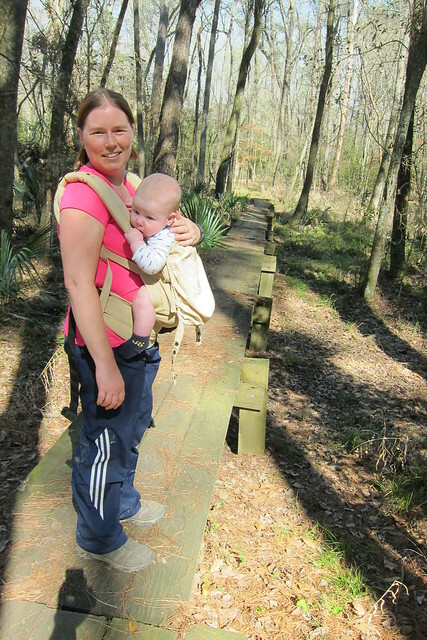 It’s been far longer since I’ve done any hiking, last May when we were at Nails Creek State Park and I was six or seven months pregnant. 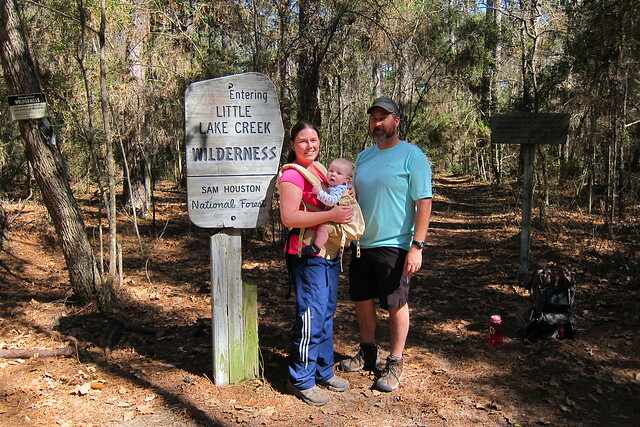 We’ve had some nice stretches of weather these last few weeks intermingled with cool spells, but this last week we were in the middle of a beautiful stretch so I mentioned to Chris that I wanted our first Valentines Day as a family to be a hike. I decided early on I wanted to carry Forest in the Ergo carrier but then I got to thinking that I thought he might be big enough for the Osprey Poco Premium backpack we have for him. I thought he might be close but Chris didn’t think so, I think we have another month or so before he’s ready. I’m going to be excited when I can put him in that and put him on my back in the Ergo. I did the front carry in the Ergo and it was a little awkward for the 7.8 miles of trail. I’m actually surprised my back isn’t more sore, especially since he’s a hefty 18 pounds! Before we left I printed off the two maps of the Lone Star Trail that were near the town of Montgomery, Wilderness and Kelly/Caney Creek. 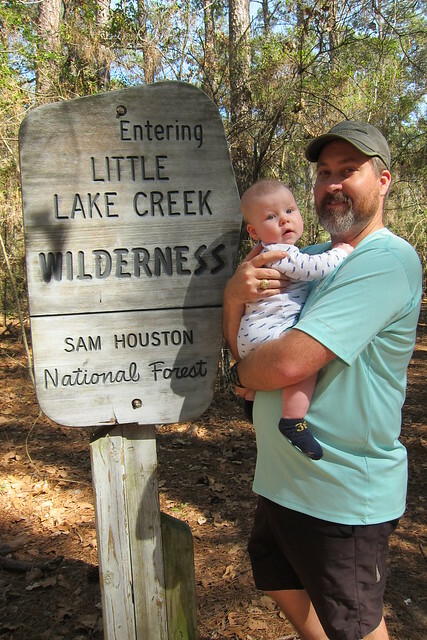 The LST is an almost 100 mile long trail in the Sam Houston National Forest with about another 20+ miles of connector and loop trails. You can check out the maps here. I told Chris to identify an approximate 5 mile stretch for us to do—apparently he came up with a 7.8 stretch instead, the North Wilderness Loop! 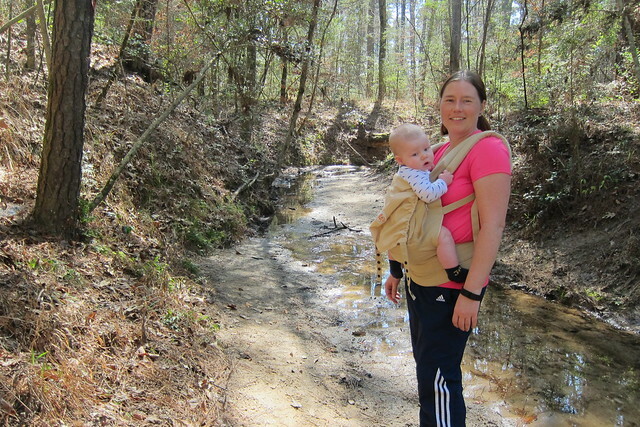 It worked out…now I know we’re capable of that kind of stretch of hiking with a 5.5 month old! 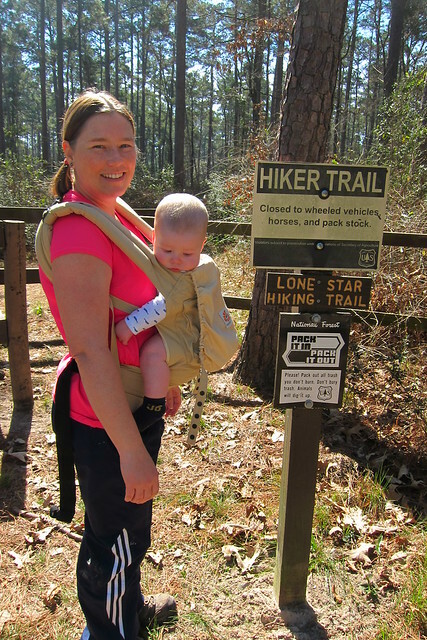 The two trailheads on FM 149 were full, which I was happy to see. I’m sure the other trailheads along the trail were busy as well. We set off about 11:30 after getting a little bit of a later start than we wanted and stopping by the grocery store to get chicken strips for our trail lunch. Spring was slowly awakening the forest as we strolled through, but there was still a lot of brown and not a lot blooming. Chris carried his lighter/smaller Osprey backpack so he could tote Forest’s diapers, changing pad, and all of that gear, including our water, lunch and snacks. After we got on a the trail we realized we’d forgotten two things that we normally carried, toilet paper and a handkerchief. See? It’s been awhile! We decided if worse came to worse we could use Forest’s wipes. 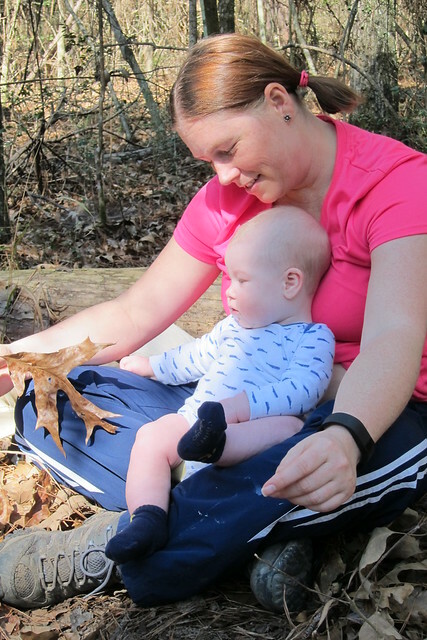 Changing Forest on the forest floor was fun because all he wanted to do was grab huge handfuls of leaves and pine needles and try to stuff them in his mouth! We stopped twice to nurse along the way, and Forest enjoyed checking out the leaves, but I still had to keep him from shoving them in his mouth. 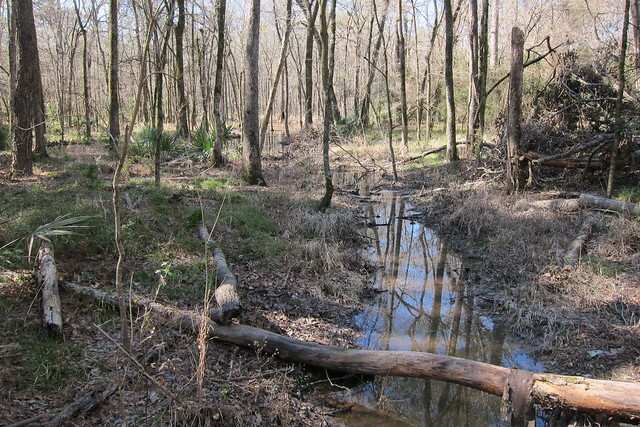 Several creek crossings made for some diversity in habitat. A few of them were a bit steep to go up and climb down, especially with Forest on the front carry. Forest took two good snoozes along the way. One of the times I had to hold his head a bit since he kept bobbling and wanting to lean against the strap of the carrier instead of placing his head on my chest. If you see the strap in this picture it’s covered in drool because he was leaning out and sucking on it as we hiked. 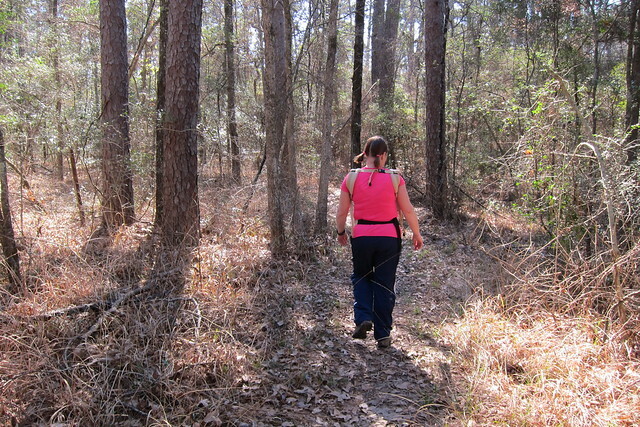 Crossing a bottomland area along the trail. The only animals seen along the trail were birds, though we heard lizards in the brush quite often. We thought maybe we’d see a snake or two since it was a warm day, in the 80s, but nope. There were quite a few people encountered on the trail, including some dogs. I did see some racoon prints in the mud along the water’s edge in this photo above. I’m very happy we got out and did this hike. I think we needed it. Multiple times I felt like my old self, wandering and exploring. Forest was fussy a few times that I got worried that we’d have to turn around, but it was just his nap-time fussiness and he was mostly upset that I wasn’t nursing him to sleep. He fussed and fussed and eventually gave in to the sleep. Now that we’ve survived once I think we’ll be back out again soon along with some car camping trips this spring. I can’t wait! !